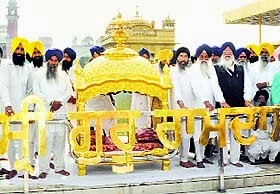 A 'palki' (palanquin) carved out of 3-kg gold was given in offering to the Harmandir Sahib by a Kanpur-based Sikh family here on Wednesday. The palki, which is worth around Rs. 1 crore, was handed over to Akal Takht Jathedar Giani Gurbachan Singh and Shiromani Gurdwara Parbandhak Committee (SGPC) chief Avtar Singh Makkar at the shrine. The Guru Granth Sahib will be placed in the palki, which was offered by Mohinder Singh Kathuria and his wife Prabjit Kaur. The Jathedar while accepting the offering, offered a prayer for the wellbeing of the Kathuria family. The golden dome on the top of the palki was also given in offering at the shrine by two devotees, Surinder Singh and his brother Swinderpal Singh. The dome was later fixed to the palki. This dome was carved out of 1.25 kg gold.